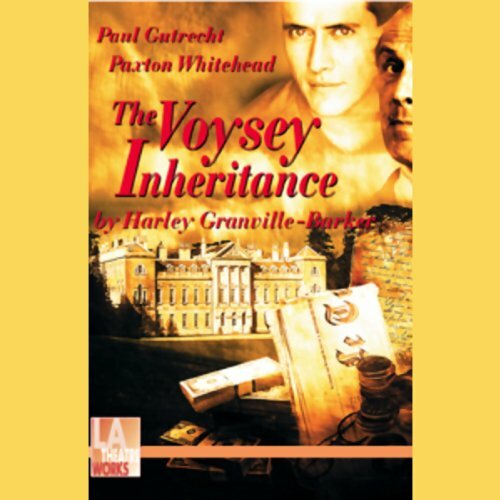 The Voysey Inheritance, by British playwright Harley Granville-Barker (1877-1946), is a mesmerizing glimpse into the unscrupulous inner workings of a wealthy Edwardian family. Heir Edward Voysey uncovers the unsavory truth about his clan’s fortune, which was amassed in a fraudulent manner over several generations. When he confronts his father about the corruption, he discovers that the treachery runs deep. Actors Paxton Whitehead, Paul Gutrecht, Robin Gammell, Serena Scott Thomas are compelling and charming in this recording of a live performance. In this suprisingly modern psychological portrait, a prosperous Edwardian family is torn apart when young Edward Voysey discovers that his family's wealth was obtained through three generations of deceit and theft. This is a captivating study of turn-of-the-century morals.